That was almost thirty years ago. And ever since then, the family joke is that I’m the star of a late-night cable TV show called the College-Educated White Guy Handyman. A show featuring a weekly home repair or improvement disaster. In my defense, home repair skills take a lengthy education of their own, and mine was limited to watching my college professor father blow a chunk out of his Swiss Army knife cutting through a live wire while trying to replace the plug on a table lamp. As time goes by, I have gotten better, but usually my first attempt at doing any kind of repair or improvement goes awry. 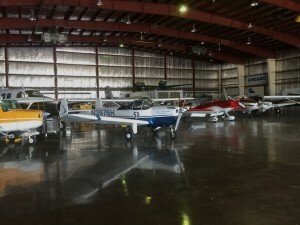 A recent case in point: Our hangar floor. Now there are two things you need to know. 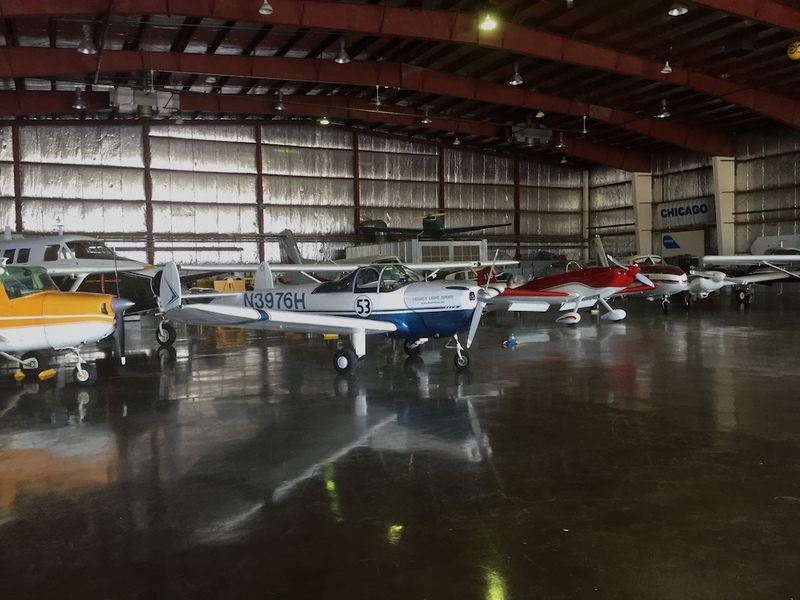 The first is that the airport will let me deduct the cost of any improvements to our hangar from our rent, and the second is that while traveling the country in two seasons of racing, we saw some pretty swank hangars. Oh. And a third thing. I’ve been suffering hangar floor envy ever since Lisa and I connected our hangars. You see, she has a wall-to-wall cement floor. I have a gravel floor with a 15×15 foot concreate pad for Tess to rest on. Of course, I didn’t know it was 15×15 until too late. I think my non-college educated Hispanic handyman father-in-law told me something about measuring twice, but I’m getting ahead of myself. About two months ago, I got it in my head that I could trump Lisa’s expanse of concreate if my humble pad of concreate were more swank than her concreate. How would I do that? Well, really swank hangars have really swank epoxy floor coverings. Some glow like mirrors, others have interesting patterns, but all of them are tough as diamonds and as an added benefit, their non-absorbent surfaces reduce oil spill clean-ups to a simple flick of a towel. I don’t recall how, but I recently discovered that there is a do-it-yourself version of this swank floor covering called Rocksolid from Rust-Oleum. How hard could it be? I watched the YouTube video and judged it to be no more difficult than painting, and with Tessie out of the hangar for extensive repairs, this would be a good time to take it on. 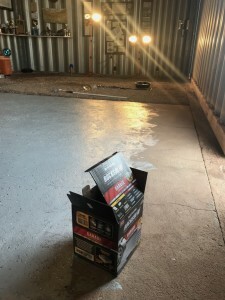 On my next trip to Santa Fe to take Rio to his flight lesson (and to check on the status of aforementioned repairs), I planned to buy a hangar-floor-in-a-box. And this is where we get to measuring. Standing in Home Depot in Santa Fe, I had no earthly idea how big my pad in Santa Rosa was. This mattered, because Rocksolid come in two sizes: The one-car garage size, with the kit covering 200-250 square feet; and the two-and-a-half car garage size, with the kit covering 450-500 square feet. Picture me in Home Depot trying to astrally project myself to my hangar. I decided that although the hangar itself is huge, the concreate pad in the middle was much smaller than a one-car garage. And I was so convinced of this that it didn’t even occur to me to measure it later on, even though I had several opportunities to do so between the time I bought the smaller kit, and when it was warm enough to break it out and paint it on. Of course, any of you who are sharp at math know that 15×15 equals 225 square feet, smack dab in the middle of the theoretical range of what the kit will cover. I’ll spare you the details of the various trials and tribulations of preparing the concreate: Sweeping, hosing, scrubbing with degreasers, more hosing, scrubbing with dish soap, more hosing, etching with acid, more hosing. Instead, let’s jump straight to the main event. Actually, I’ll spare you the details of the main event, too. Just suffice it to say the goop is the thickness of maple syrup but you are to spread it as thin as paint. And that my cement pad is full of ridges and channels and cracks and dips. And the roller was a magnet for the nearby gravel. And that the handle of my roller brush broke. And the foam bush they gave me with the kit delaminated. Yes, that’s right. I ran out of swanky Rocksolid material pretty much right at the 200 square foot mark. Measure first. Who knew? Oh. That’s right. My father-in-law. I spent hours flying Tess and Warbler above the southern New Mexico desert scouting the route. Hours more getting just the right pictures of it. I spent days designing and laying out the beautifully printed knee boards for the race pilots. I’m embarrassed to admit how I paid for those. I carefully plotted the race course on Google Earth Pro, measured the legs, then applied the proper math to compensate for the turn radius of the planes. I worked out handicaps for the three sizes of engines under the cowls of Ercoupes. I created an Excel spread sheet to calculate the speeds based on the start and finish times, and to automatically handicap the planes. I worked out the marshalling order, created timing sheets, bought a pair of atomic clocks, a green start flag, and a checkered finish line flag. I had three beautiful trophies made for the fastest planes. Tall skinny towers a topped with cups like the air race trophies of old. Then I had custom medals struck for each pilot that flew, so that everyone would win something. 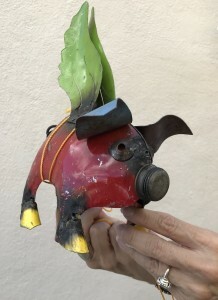 I also, in SARLtradition, found the cutest little pig with wings for the slowest plane. 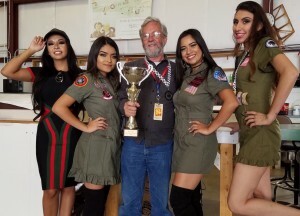 I connected with a local talent scout and recruiteda group of models that became known as the Derby Dolls to set the NASCAR-with-wings tone I was after. 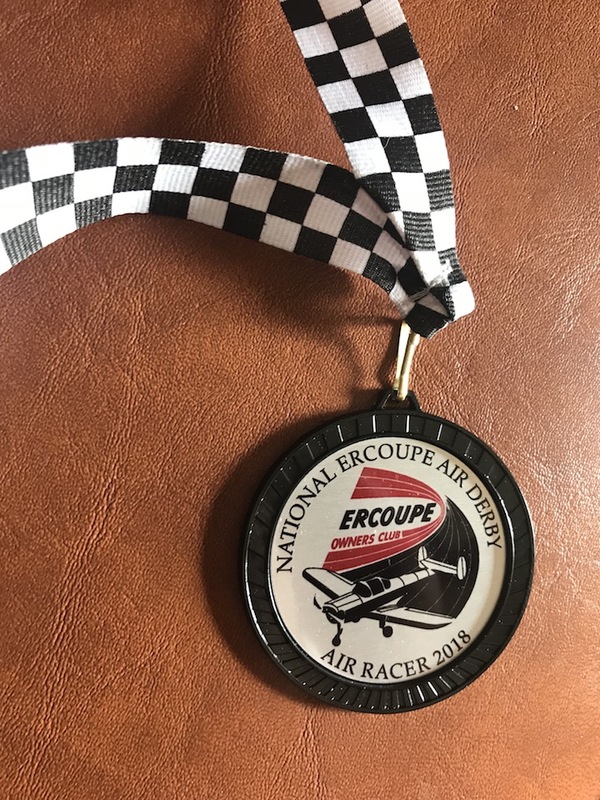 Sure, the rare opportunity to fly into highly restricted air space and land at Spaceport America was the real reason most of the pilots were coming to the 42ndErcoupe Owners Club Nationals; but to me, the signature event was my air race—which I named the 1stNational Ercoupe Air Derby. Needless to say, I had secret fantasies of it becoming an annual event, maybe even a league someday. Twenty-one of the forty-eight planes coming to the convention signed up for my Derby, and I realized that I had on my hands the largest race of like-kind planes since the 1930s. Cloud nine itself, however, was at 200 feet. AGL. Apparently, despite all my careful planning, I forgot to make the appropriate offering to the weather gods. Arrival day at the national convention varied between low IFR and garden variety IFR most of the day, with a brief gasp toward the end of the day of the most marginal Marginal VFR I’ve even seen. Only one brave soul made it in. As twilight crept in at the end of the day, I stood out on the cold, wet apron and looked at the small collection of Ercoupes. Instead of the expected 48 planes that would have over-flowed the ramp, I had six, only two of which had entered the Derby. It was decision time. 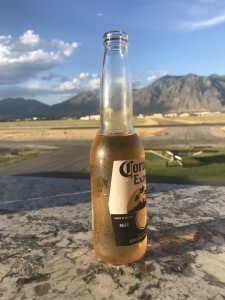 The weather for race day looked fine, but most of my racers were MIA, trapped by hurricane-whipped moisture all across the country, and there was no way that they’d make it in before the scheduled dawn briefing. I considered moving the race, but it was like trying to re-arrange jigsaw puzzle pieces. It just couldn’t be done. There were too many other events that needed to take place when they were scheduled. 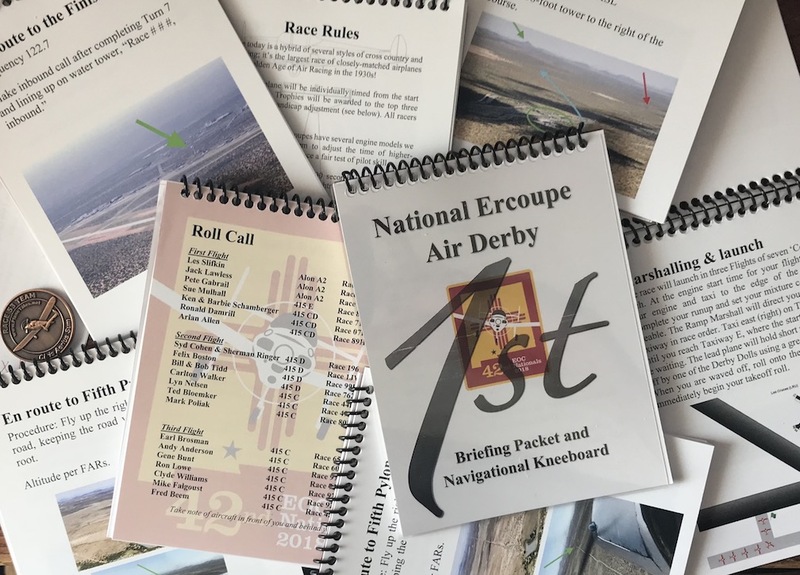 I was about to cancel the first ever National Ercoupe Air Derby when my buddy Lisa, who is a certified frickin’ genius, had a suggestion. In the swag bags for the convention were toy balsa wood gliders from the state Aviation Division. Why not create some sort of Air Derby with them? After all, we had no shortage of pilots. Men and women who locked their fogged-in hangar doors, jumped in their cars and drove in, or jumped on commercial flights and rented cars to reach the convention. 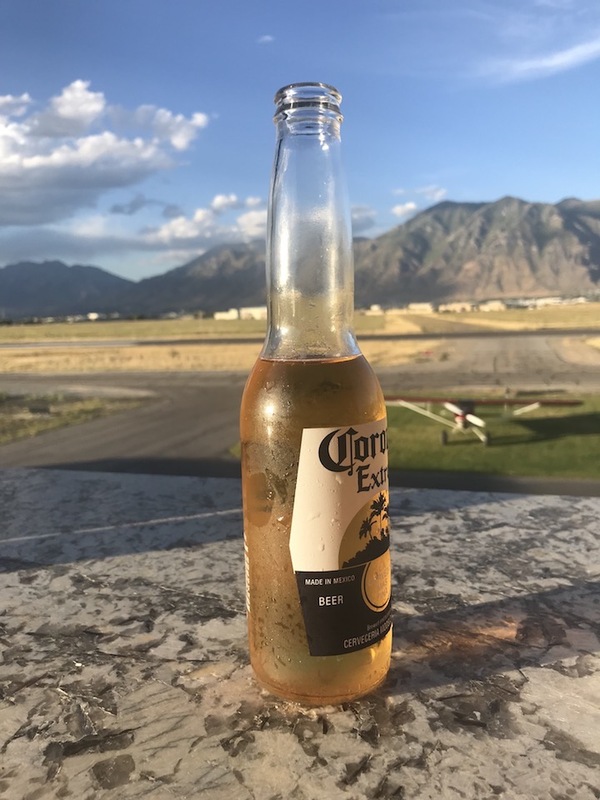 The next day, when I should have been marshalling twenty-one Ercoupes onto Taxiway Alpha at KLRU, I was setting up orange cones on the ramp in front of EAA Chapter 555’s hangar, roughly mimicking the layout of the real race. I wasn’t too sure how I felt about it. Then my cell phone starting ringing and the assorted crises that befall convention coordinators started befalling me. Chief among these was the Spaceport. They needed to know precisely how many people were coming the next day, their names, states, blood types and genotypes; and who was stepping off a plane and who was stepping off a bus. And they needed to know RIGHT now! Of course, I’d given them this information weeks ago, but now with the weather, it was a moving target. 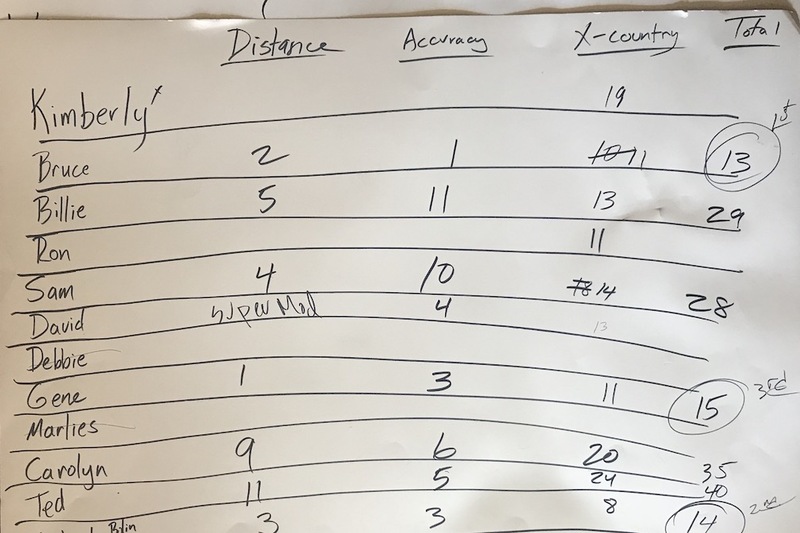 On a borrowed laptop I started throwing together a new spreadsheet (not having the sense to bring the one I had previously made with me) and began to code pilots by: Cancelled, switched from air to ground, still coming by air, and unknown at present. I knew our fearless leader, club director Larry Snyder, was trapped in Tucumcari, having failed to reach my home base of SXU by a few miles before weather forced him to retreat. He emailed, “Had to turn back. Solid wall of rain and maybe 1 mile visibility.” A pity. Our hotels and restaurants are better. I knew I had a handful of planes in eastern New Mexico, and the story of those pilots trying to find a rental car is worthy of a Plane Tale of its own someday. And I knew that eight planes were bottled up together at Willcox, AZ, more than had reached the convention itself. I also had one pilot who was missing. The night before, Flight Service called to ask if he’d arrived. His flight plan was overdue and not closed. He hadn’t. I tossed and turned all night worrying about him, and it gnawed at me the next day. When he eventually showed up I was so happy to see him, I gave him a giant bear hug. The rest of the fleet? Who knew? Certainly not me. 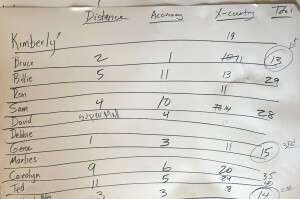 Working from a tattered, folded, damp print out of the master registration list, I struggled to update the Excel spread sheet, while answering my phone every ten minutes (have you noticed that cell phone batteries never die when you want them to?) and alternately talking to members with a wide variety of questions, issues, comments, and suggestions. I was starting to, you know, stress out a little, when I heard it. I heard the sound of a party. Happy voices. Laughter. Cheers. The sounds were drifting into the EAA hangar from the ramp. I got up and stuck my head out the door. A crowd had gathered to cheer on the Basal Wing Derby pilots. The wind was up, snatching the light gliders. One pilot used tape to increase his weight. Another swore her secret was to aim low and throw low. It was getting competitive, to say the least, but everyone was having a blast. The Derby Dolls were on hand working the green and checkered flags, and Lisa was keeping point totals on two giant sheets of poster board that kept flapping in the wind. I was witnessing the birth of a new aviation sport. At the end of the trio of competitions, the Derby Dolls gave out the custom Air Racer medals to each person who participated in all three Basal Wing events, and presented the tall skinny trophies a topped with cups to the top three scoring pilots. Talk about salvaging a disaster! Not only did our members have a blast, probably more people had more fun than if my race had gone off as planned. 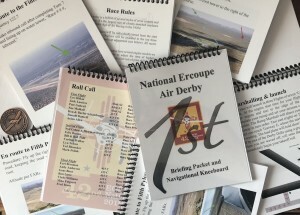 Of course, that’s not stopping me from planning the 2ndNational Ercoupe Air Derby for next year. You know, with real airplanes this time. But still… I think I’ll ask the state for another handful of those basal gliders next year.